Massanutten Village is the oldest and largest district in the Massanutten area. The development of the residential resort community began in 1971. In January 1974, the Massanutten Property Owners Association (MPOA) was formed and incorporated under Virginia Law. The Articles of Incorporation state that MPOA was formed «to provide for security and for maintenance of streets, open areas, trails, recreational and other facilities» owned by MPOA in Massanutten Village. MPOA’s first operating budget was roughly $150,000 in 1974. In 2009, MPOA’s had total operating budget of slightly less than $2.5 million. The majority of MPOA’s operating expenditures provide for the essential services of law enforcement, road and open space maintenance, and administration. These essential services were detailed in the previous four (4) sections to include staffing. In 2009, MPOA’s expenditures for essential services is shown in the table below. As one can readily see from the table, MPOA spends roughly one-third of its essential services budget on law enforcement, one-third on maintenance, and one-third on administration. Please note that MPOA collects separate fees which pay for regular trash collection and recycling services for its property owners. This expenditure is included in the above table of essential services expenditures. Please also note that MPOA has operating expenditures related to its recreational facilities and commercial ventures. These expenditures were not included in the table as they were determined not to be essential services. For purposes of this report, the revenues and expenditures related to MPOA recreational facilities and commercial ventures will be considered as a separate cost center. The primary purpose of these operations is for the exclusive enjoyment by MPOA members or for earning net revenues to offset essential services expenditures. The primary source of revenues to pay for MPOA essential services is fees assessed to and paid by MPOA property owners. There are two-thousand and fifty-two (2,052) residential and timeshare properties in MPOA, whose owners pay fees in a fixed amount established by the MPOA Board. In 2009, the annual MPOA property owners’ assessment fee was $535 per property. It is important to note that this fee is actually equivalent to a real estate tax rate of roughly $0.24 per $100 value of the average assessed single family home in Massanutten Village. This is equal to a town real estate tax rate twice that of any town in Rockingham County and would be amongst the highest in Virginia. A summary of the MPOA revenues is shown in the table below. In addition to assessment fees, MPOA receives an annual contribution from the developer of Massanutten Village — Great Eastern Resorts (GER). This contribution is a fixed amount based on a complicated formula derived in a historical agreement between MPOA and GER that increases proportionately as total property owners’ assessment fees increase. The GER contribution was $77, 499 in 2009. MPOA had several other sources of revenues in 2009. The large flag poles at the entrance to Massanutten Village were rented out to cell phone companies for telecommunications purposes. MPOA received annual net revenues of $17,935 from this rental. MPOA also operated a rental program for property owners of MPOA timeshare units. MPOA received annual net revenues $71,336 from operating this program. MPOA also operated commercial ventures that generated net revenues which help defray the costs for essential services and help offset the cost of providing amenities for the exclusive free use of its members. The MPOA Miniature Golf Course and the MPOA Go-Kart Race Track are commercial ventures that generated net revenues of $377,431. And, the MPOA Maintenance Department generated net revenues of $11,916 by providing paid landscaping services to property owners, to include such things as mulching and tree removal. Although the MPOA Pool Area generates some net revenues by operating a snack bar commercial venture, it had a net operating loss of $39,486, resulting largely from the cost of staffing the community pool with lifeguards in the summer. The pool is an MPOA amenity used exclusively by MPOA members. From the tables above, it can be seen that more than 70% of the cost of MPOA essential services in 2009, to include law enforcement and road maintenance, are paid for by MPOA property owners. Roughly 25% of the cost is paid for by MPOA commercial ventures. And, less than 5% of the cost is paid for by Great Eastern Resorts. 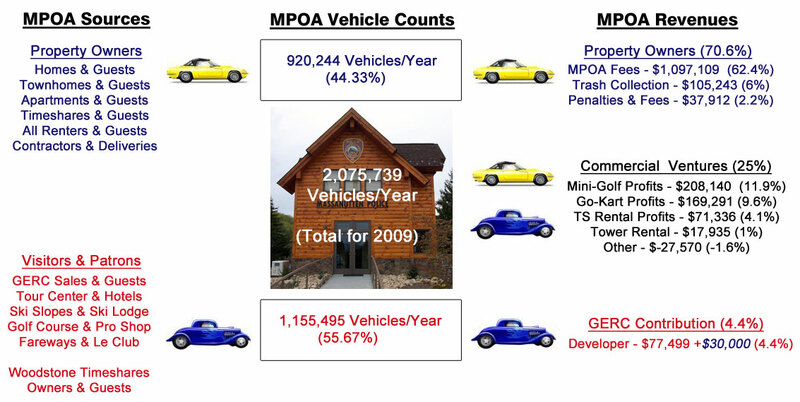 Yet with 70% of the cost of MPOA essential services being paid by property owners’ assessment fees, more than 55% of the vehicles entering into Massanutten Village in 2009 were not related to MPOA. These vehicles carried individuals, largely coming from the general public, to patronize Great Eastern Resorts businesses — they also placed a burden on the essential services of road maintenance and law enforcement. The inequity of the cost versus burden on essential services is graphically depicted in the figure below.